I launched into Uranium: War, Energy, and the Rock that Shaped the World by author/reporter/editor Tom Zoellner in my hometown of Sandusky, Ohio, appropriately in view of the 889 megawatt Davis-Besse nuclear plant on the shores of beautiful Lake Erie. The perfect spot to begin contemplating Zoellner’s tome. In October 2005, a customs official in Tanzania made a routine inspection of a long-haul truck carrying several barrels labeled columbite-tantalite, otherwise known as coltan…One of his bosses later recalled the scene to a reporter: “There were several containers due to be shipped, and they were all routinely scanned with a Geiger counter. This one was very radioactive. When we opened the container, it was full of drums of coltan…When the first and second rows were removed, the ones after that were found to be drums of uranium.” The truck had come into Tanzania from neighboring Zambia, but had started its journey in the Congo. Making [the] pitch requires what brokers call a “story” – a quick verbal summary of where the claim is located, what its historic reserves might be, what kind of drilling has taken place so far, and some brief biographies of the management team. The story is what moves the stick, not the actual uranium that might be pulled out of the ground, which is a faraway concept almost irrelevant to the entire process. The old saying in Hollywood goes that anybody is a “producer” who has a quarter to put into a pay phone, and the bar is set low in a similar way in Vancouver, where anybody who can hire a geologist to sign a disclosure and a promoter to hype the stock (euphemistically called V.P., investor relations) can be the president and CEO of a uranium company. Zoellner’s examples like these throughout the book form a good reality check that whether we’re talking about reserve estimates or export controls, that the reality on (or in) the ground is not always the picture painted for us by businesses, exporting countries, or policy makers. Mineral supply chains are complicated processes that can be easily impacted by manipulation or miscalculation. I also could have wrapped up this pleasant summer reading thinking that its most important lessons concerned the debate over the future of nuclear energy in developed countries attempting to cut greenhouse gas emissions and developing countries trying to access reliable electricity. If a nuclear renaissance is in our midst – a topic which Zoellner explores well – the issues this book highlights, from waste disposal to material proliferation, are likely to grow worse. But what Uranium really brings to mind is biodiversity. That’s right: biodiversity. It is certainly difficult to wrap your head around what that means for the human race, but particularly for national security. Outlining the linkages among biodiversity, food availability, clean water systems, human behavior, migration, conflict, and security is the easiest route to understand but extremely difficult to prioritize. But how do you rack and stack such an abstract threat? As Uranium recounts, the dawn of the age of nuclear weapons was the last time that humans had to face a fundamental change that could threaten our ability to live prosperously on the planet. As the world built enough nuclear weapons to wipe out life on Earth, the government and media took pains to lead citizens to believe that they could survive nuclear attack by covering their heads or hiding in fallout shelters in order to help the public grapple with thoughts of such destructive power. Plans to emphasize the peaceful uses of nuclear technology shaped U.S. strategy in the early Cold War years and played a strong hand in governing its international relations. Mass extinction is slower, less spectacular, and can’t be shown in a short video clip. But the path Zoellner traces through decades of psychologically wrestling with the concept of living in a world inherently different from previous eras in human history suggests how people might come to understand the destructive potential of declining biodiversity. Fundamental shifts in the basic ways of the world are destabilizing. Nuclear weapons are such a central part of U.S. strategy, how the government makes security calculations, and the calculations other countries make about us that a simple reminder that they are dependent upon often precarious economic and accounting systems surrounding one type of rock is sometimes laughable, and sometimes unnerving. But the best lesson I take from Uranium is more fundamental: whether through our intentional manipulation or unforeseen consequences of our actions, security inherently involves man’s relationship with nature. 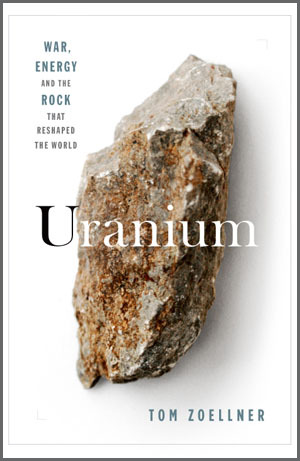 Photo: Cover image of Uranium: War, Energy, and the Rock that Shaped the World. Courtesy of Tom Zoellner.